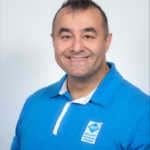 After a Skype for Business meeting that was being recorded, the status of the recording in Skype for Business Recording Manager was in a pending state for over an hour and would not create the recorded file to share. I logged back into the meeting and verified that the recording was stopped which it was. I then noticed that my Surface was running off of battery, which I know that the rendering of the recording requires a lot of CPU power. I plugged into my Surface into a power source and instantly the status changed from pending to creating and then ultimately completed successfully. Thank you so much – that fixed my issue. I would have never thought to plug in my laptop to resolve this type of problem. How did you even figure this out? 🙂 This sorted out what worried me most of the times! Thanks! Same issue here.. lame…but glad my recording is finally downloading. 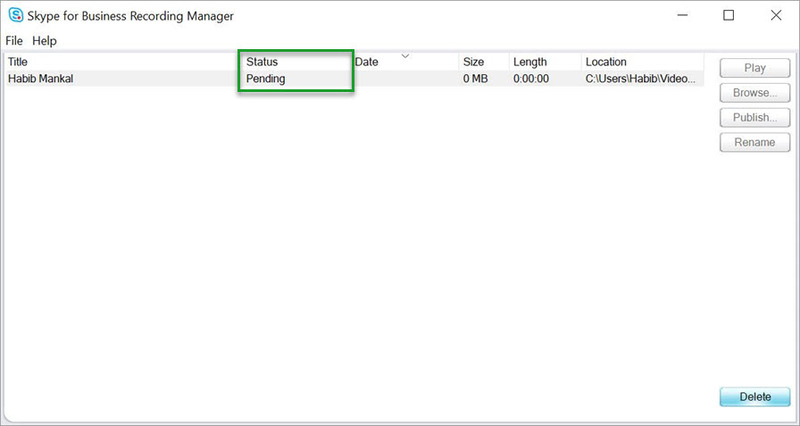 Skype for Business should have an admin portal where it can manage recordings online.. seems lacking compared to WebEx. So if i skype from different computers.. there is no central storage for recordings. Frustrating..
Hi Amy, you will be able to do this in Microsoft Teams as they are enabling the ability to perform cloud based recording. You will have to verify what license level you have , and work with your MS account rep to ensure you have the appropriate licensing. Thought a 2 hour meeting\training session was toast – what a relief! Thank you – exactly what I experienced as well! You saved my lots of efforts. Thanks a lot..!!! Who thought of plugging in your laptop for the render? You’re a lifesaver! Really interesting:)… it worked for me too. thanks a lot. Well this is why I Google stuff and then find answers like yours. Awesome. Saved my bacon on a significant project and limited time with a SME. Legend. Fantastic find! I always panic when a recording stays stuck on Pending and never understood why sometimes it would work and other times it would not. You saved my life!!!! Thank you! Boy this saved my bacon this am, thought I was going mad ….. thanks for the tip it worked for me! Thank you. My co-worker is no longer stuck at home waiting for the recording to start. Thumbs up. This was my problem. A remark. On a windows 10 pc you need to restart windows. Not close. And then your trick did it ! Wow this is awesome, it’s saved my day. Thank you so much, this is awesome! Thank you so much! This saved me… recorded something for 20 minutes and I thought all was lost! Fixed immediately once I plugged it up. helped here also. thanks for sharing! Awesome – totally fixed mine too! Woohoo! This is it. What a relief. I thought I messed up some how. Thanks. Can’t they just put a message to say something like “plug into power”! Another thank you so much. Hope you are feeling good. Good that you documented it. It helped a lot of people, incluing me. Thank you. great troubleshooting, logic i missed – how the charging pushing to initiate the recording save progreess?, My battery will come 2more hours. but after plugin – it got initiated to save. Awesome.I am pretty worried that I did something wrong while recording. perfect – thank you so much! I had started believing that I lost all my work done today. Thanks, worked for me! Have a great day!! That resolved my issue too, thanks! 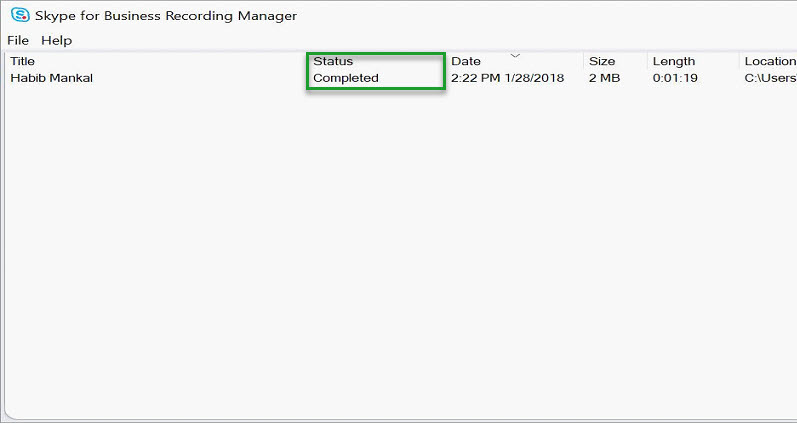 This is sucking issue of recorder, no information that why it is pending in the recording manager. Your page helped me, thank you so much. After my pure panic subsided I was able to find your post. After plugging my laptop in it immediately began creating. thanks so much… i was worried i hadn’t recorded correctly. Thanks!! I had this issue and it inmidiately began to save the recording once I plugged in the power source to the laptop. Thanks a lot, it worked !!! Wow! Solved my issue. Thank you! Thank you, helped me too. wouldn’t have thought plugging in charger will resolve it. thank fully i didn’t delete before checking here. This tip resolved my issue too. Thanks a lot Hab. wow, this worked, thanks for saving me!!! Thanks – would never have thought of this – and it’s worked – saved my bacon seeing as I had recorded some application walkthroughs to make some updates for a customer, and was super concerned I’d lost them. Thank again. brilliant troubleshooting, i had been wondering if i did something wrong, this recording was particularly very important for me. again, i thot perhaps it’s slow due to internet. if i logged out, and put my PC to hibernate might lose it all but thanks to you, I could get it done. But it’s kinda weird that skype doesn’t show up any tool tip or probably it would resume whenever the power source is on. but there’s also a possibility that it could break the connection – after all the reference is stored in a temp folder. It’s awesome. May be very few straightforward answers on Google. thank you so much this is indeed the solution also with my dell laptop. plugin power and it start creating. Everyone is replying that it worked, And yes it worked. 😀 This was first query which solved in first google search 😛 😀 Just thought to comment here for saying you thank you. 🙂 I was in shock for few moments thinking important recording gone in vain. But you saved us. 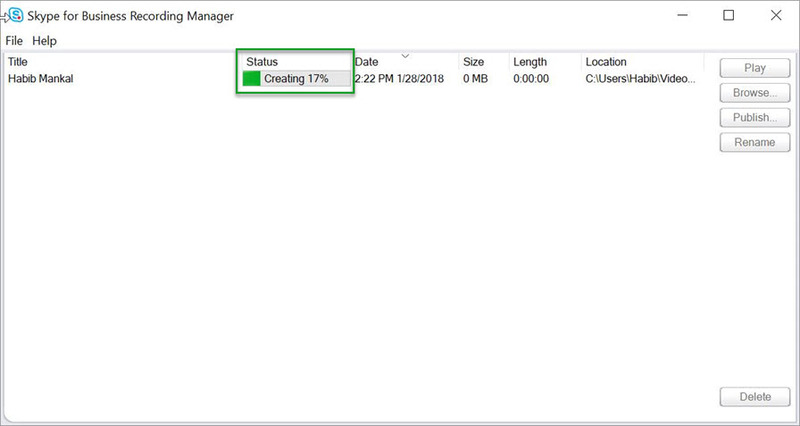 Was searching any option there in recording manager to resume the processing of recording :P. It might be the case that once recording is proccessing it should not be interrupted by low battery shut down. Just a guess. Thank you .This solved my issue. Wonderful catch. Another thank you! I just panicked that a two-hour recording was lost forever…!! All it needed was power to my laptop! Awsome that you posted this. Thanks.